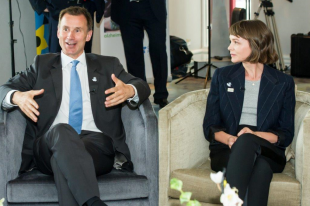 Oscar-nominated actress Carey Mulligan has today been appointed by the Alzheimer’s Society and Health Secretary Jeremy Hunt as the first ever UK Global Dementia Friends Ambassador. In her new role, Carey will bring both international attention to the benefits of making communities dementia friendly, and a renewed focus on the Alzheimer’s Society’s Dementia Friends programme in England. The Dementia Friendly Communities and Dementia Friends programmes are transforming the way people think, act and talk about dementia. They are part of the Government’s ambitious policy agenda on dementia, which highlights the UK’s continuing global leadership role. Key aims are to tackle the stigma around dementia that results in people feeling excluded from their communities and improve the lives of those with the condition and their families. To mark the announcement, Carey met with Jeremy Hunt at Heathrow Airport, which is working towards becoming the world’s first dementia friendly airport, to lead a Dementia Friends training session for the airport’s staff. She set out the UK’s role as a global leader in dementia and outlined her plans to champion the rights of people with dementia across the world. Dementia is the biggest health and social care crisis facing the world today. 47.5 million people are living with the condition globally, with this number set to rise to 135 million by 2050. While awareness of dementia is improving internationally, stigma is still rife in many communities. In some countries, people with dementia are excluded from playing an active role in society while too many people still lose relationships and jobs because of misconceptions that exist around the condition. Through a programme of activity at home and overseas, Carey will inspire and engage world leaders to tackle stigma and promote understanding of dementia – a condition which her grandmother, affectionately known as Nans, lives with. Her first action in her new role will be marking World Alzheimer’s Day on 21 September by delivering a Dementia Friends session to a Youth Group in Los Angeles to spread greater awareness amongst young people about the condition. Since 2013, over 1.6 million people have signed up to become a Dementia Friend, England’s biggest ever social movement on dementia, all of whom have committed to taking an action to help someone with dementia in their community. Alzheimer’s Society is working to reach 4 million Dementia Friends by 2020. There are already over 150 dementia friendly communities in England alone. Heathrow airport is a pioneering example of an organisation that is working towards becoming dementia friendly. The airport has provided a specially personalised customer journey for passengers with dementia where in advance of their flight they can take part in a virtual 360 degree tour of their journey and are provided with quiet and therapeutic areas in the airport to wait in. Heathrow has also pledged for all 76,000 customer-facing staff to be dementia-aware, through Dementia Friends sessions, training and online resources. So far 301 key staff who regularly interact with passengers affected by dementia have become Dementia Friends and Omniserv now include Dementia Friends training as part of the induction training for all new staff joining the team. My Nans has dementia and I have experienced first-hand how devastating it can be. It affects everyone differently, and it’s so important that everyone affected by the condition is treated with the respect and dignity that they deserve. At the moment, there’s not nearly enough awareness and as a global society we have a duty to change that. The first step involves educating people and breaking down stigma – not just on our doorstep, but across the world. I’ve seen my Mum doing this in her role as a Dementia Friends Champion - now I’m honoured to become the first Global Dementia Friends Ambassador and help Alzheimer’s Society and the Government change global attitudes towards dementia. We have made great strides in improving diagnosis rates, investing in research and creating the first dementia friendly communities, but we still have much further to go to promise everyone that they will be able to live well with the condition. The impact of dementia tears at families and at our social fabric - that’s why making progress is a key government priority. Carey Mulligan will be a great asset both in raising awareness and promoting the benefits of the Dementia Friends programme – at home and globally. Dementia doesn’t stop at UK borders – it’s the biggest health crisis facing the world today. One of the biggest challenges in creating Dementia Friendly Communities is getting people to talk about dementia. Dementia Friends has proved to be a great springboard to inspire global dementia action. We are delighted that Alzheimer’s Society supporter Carey Mulligan will be leading the way in her role as Global Dementia Friends Ambassador. As the global dementia crisis snowballs, collaboration between countries is crucial in creating lasting change and a global dementia movement towards acceptance, inclusion and support for people living with dementia and their carers. We look forward to Carey’s leadership helping us tackle stigma on an international scale and achieve better lives for people with dementia the world over. This blog is to update journalists with the latest news from the Department of Health and Social Care Media Centre. Subscribe for the latest news and updates as well as exclusive ministerial commentary. Contact our Media Centre if you are a journalist with a media enquiry or interview request.